Mar 19 Things you need to know about the book "The 4 Discipline of Execution"
Do you remember the last major initiative you watched die in your organization? Did it go down with a loud crash? Or was it slowly and quietly suffocated by other competing priorities? By the time it finally disappeared, it's likely no one even noticed. What happened? The "whirlwind" of urgent activity required to keep things running day-to-day devoured all the time and energy you needed to invest in executing your strategy for tomorrow! The 4 Disciplines of Execution can change all of that forever. 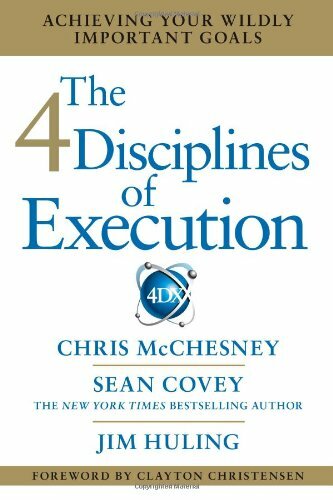 The 4 Disciplines of Execution (4DX) is a simple, repeatable, and proven formula for executing on your most important strategic priorities in the midst of the whirlwind. By following the 4 Disciplines –– focusing on the wildly important, acting on lead measures, keeping a compelling scoreboard, and creating a cadence of accountability –– leaders can produce breakthrough results. 4DX is not theory. It is a proven set of practices that have been tested and refined by hundreds of organizations and thousands of teams over many years. When a company or an individual adheres to these disciplines, they achieve superb results –– regardless of the goal. 4DX represents a new way of thinking and working that is essential to thriving in today's competitive climate. If you’re leading people right now, you are probably trying to get them to do something different.Whether you lead a small work team or a whole company, a family or a factory, no significant result is achievable unless people change their behavior. To be successful, you will need their commitment. Getting the kind of commitment that will endure in the midst of the daily grind is not easy. Focus your finest effort on one or two goals that will make all the difference, instead of giving mediocre effort to dozens of goals. Execution starts with focus. Without it, the other three disciplines won't be able to help you.A wildly important goal (WIG) is a goal that can make all the difference. You're going to commit to apply a disproportionate amount of energy to it — the estimated 20 percent that is not used up in the whirlwind. In determining your WIG, don't ask “What's most important?” Instead, begin by asking “If every other area of our operation remained at its current level of performance, what is the one area where change would have the greatest impact?” Whether your WIG comes from within the whirlwind or outside it, your real aim is not only to achieve it, but also to then make the new level of performance a natural part of your team's operation. While a lag measure tells you if you’ve achieved the goal, a lead measure tells you if you are likely to achieve the goal. For example, while you can't control how often your car breaks down on the road (a lag measure), you can certainly control how often your car receives routine maintenance (a lead measure). And the more you act on the lead measure, the more likely you are to avoid that roadside breakdown. We call them lag measures because by the time you get the data the result has already happened. A lead measure is predictive, meaning that if the lead measure changes, you can predict that the lag measure will also change. A lead measure is also influenceable; it can be influenced by the team.It's the data on lead measures that enables you to close the gap between what you know your team should do and what they are actually doing. Without lead measures, you are left to try to manage to the lag measures, an approach that seldom produces significant results. The third discipline is to make sure everyone knows the score at all times, so that they can tell whether or not they're winning. This is the discipline of engagement. If the lead and lag measures are not captured on a visual scoreboard and updated regularly, they will disappear into the whirlwind. People disengage when they don’t know the score. Great teams know, at every moment, whether or not they're winning. They must know, otherwise, they don't know what they have to do to win the game. A compelling scoreboard tells the team where they are and where they should be, information essential to team problem solving and decision-making. When team members themselves are keeping score, they truly understand the connection between their performance and reaching their goal, and this changes the level at which they play. When everyone on the team can see the score, the level of play rises, not only because they can see what’s working and what adjustments are needed, but also because they now want to win. The fourth discipline is to create a cadence of accountability, a frequently recurring cycle of accounting for past performance and planning to move the score forward. Discipline 4 is where execution happens. Disciplines 1, 2 and 3 set up the game; but until you apply Discipline 4, your team isn’t in the game. This is the discipline that brings the team members all together. If you simply tell your team what to do, they will learn little. What you ultimately want is for each member of your team to take personal ownership of the commitments they make. Mar 13 Things you need to know about the book " The 5 levels of Leadership"